Do you enjoy eating in restaurants but worry that your manners will embarrass you and the people you're with? If so, you're not alone. Most table manners and dining etiquette rules are basic and easy to learn. Keep in mind that each culture has its own rules of etiquette, so if you are traveling abroad, learn the differences and nuances of other countries. It’s a good idea to teach your children proper etiquette in all aspects of their lives, particularly when their manners may affect others. Start working with them as soon as they can talk, but don’t put them into situations until they are ready. Don’t take your children to a formal restaurant unless you speak to the maître d’ first. Many restaurants have special seating for families. Teach your children basic manners before leaving your house. Leave babies with a sitter for a more relaxed and enjoyable experience. At the first sign of a meltdown or other bad behavior, remove your child from the dining room. Have quiet activities such as coloring books and puzzles to entertain your child while waiting for the food to arrive. Learn the proper use of utensils. Generally, you will start with the fork farthest from the plate and work your way in. Don’t use your utensils to gesture. If you talk with your hands, put down your fork and knife before waving your hands about. You may think that you have to be available to everyone who has your cell phone number at all times, but when you dine in a restaurant, put your cell phone on silent. Not only is it rude to the other people in your party, but other customers also don’t need to hear all your personal or professional business. If you receive a text message, either don’t respond or send a brief message letting the other person know you are unavailable until you leave the restaurant. You must be polite to your server at all times. To be otherwise indicates boorish, bad manners. Dissatisfaction with any aspect of the food or service should be discreetly communicated to the server. If you are not happy with the response, speak to the dining room manager. Remember that the server has no control over the quality of the food or the amount of time it takes for the kitchen staff to prepare it. If you discover a foreign object in your food, such as a hair or bug, call the server to your table and quietly show him or her. There is no point in making a scene, so handle this situation as discreetly as possible. As soon as you sit down, remove your napkin from the table and place it on your lap. Use it to gently blot your lips between bites. When you get up from the table temporarily, place it on your chair until you return. At the end of the meal, don’t refold your napkin. Place it unfolded on the table beside your plate. Don’t rush through your meal. Take your time to cut your food into bite-sized pieces and chew thoroughly to prevent choking. Don’t put another bite into your mouth until you have swallowed what is already there. Not only is it unsightly to see bulging cheeks, but it is also very unhealthy to eat too quickly. Pace yourself to finish each course at the same time as the rest of your party. Keep your mouth closed when you chew. No matter how important it is to make a point, don’t talk until you have swallowed your food. Be careful not to swallow a huge mouthful in order to quickly interject a comment. 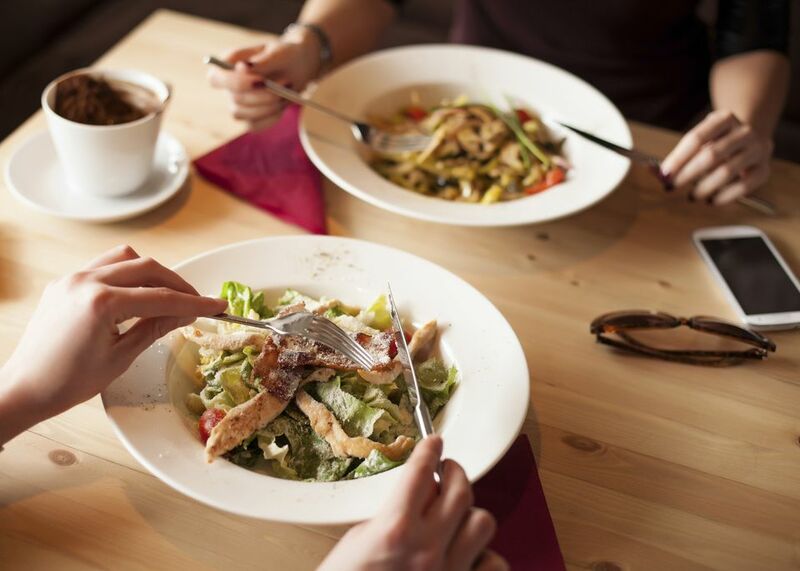 Avoid grooming at the dining table when you are eating in a restaurant. In addition to being unsanitary, it is considered bad manners to brush or comb your hair. If you must reapply your lipstick, do so discreetly and make sure you blot your lips on a tissue to prevent smearing it on the stemware, napkin or your face. Never floss or pick your teeth in public, even if toothpicks are available. If you have food stuck in your teeth, excuse yourself and take care of the problem in the restroom. Keep everything off the table that doesn’t absolutely need to be there. This includes purses, wallets, keys, and your elbows. If it isn’t food, part of your place setting, a pitcher, or a serving dish, don’t put it on the table. Very few restaurants allow smoking. However, if you are dining in an establishment that does allow it, never smoke between courses. Wait until after the meal is over, ask if anyone objects, and if you have the go-ahead, light up. However, if someone at the next table appears bothered by your smoke, excuse yourself and finish your smoking outside. Never use your plate as an ashtray. Unless you make other arrangements with the maître d or server, the host or hostess should receive the check. Place the payment holder on the edge of the table with your credit card or cash barely showing to indicate you are ready to pay. If you dine in a restaurant, you should expect to tip for service. If you don’t have the money for a tip, consider staying home or going to a buffet-style restaurant.